This course is part of a joint initiative by BCM Institute and SkillsFuture Singapore (SSG). It is the first in a three-part series SSG WSQ BCM courses. 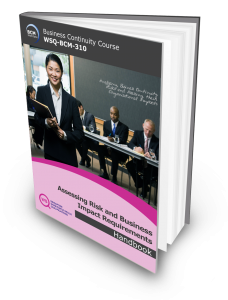 This first WSQ business continuity management (BCM) course teaches participants the know-how of assessing risk and business impact requirements. will be able to achieve the international recognised Business Continuity Certified Specialist (BCCS) certification* once they passed the Qualifying BCCS exams. NOTE: Singaporean and Singaporean PR participants in the Singapore course would also be getting a Statement of Attainment from the Workplace Development Authority at the completion of workshop and passing of assessment. BC Certified Specialist (BCCS) certification is awarded to participants who successfully completed the three part series, passed the Qualifying BCCS examination, sends in an application detailing at least 1 year of BC experience, make the application processing fee payment of SGD75 and satisfies and meets the experience requirements of the independent certification body. To train participants to analyse organisation’s dependencies that may impact on the organization and an individual’s work role. Any member of the organization involved in the implementation of a Business Continuity Management System (BCMS). New to BC or DR, or recently been involved in BC or DR project /programme within your organization.